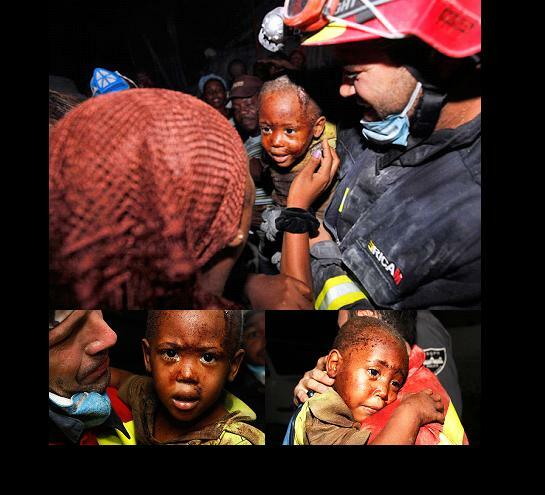 Two year-old, Redjeson Hausteen Claude, has been rescued from the rubble of his own house in Port-au-Prince. These moving photographs were taken by Gerald Herbert of the Associated Press who was in the right place at the right time. In the larger photo on top, Redjeson had just been reunited with his mom. He must be the luckiest little boy in Haiti. After two days trapped beneath the rubble of his own home, two-year-old Redjeson Hausteen Claude was rescued this morning. The toddler was clearly shocked as he was pulled free by a joint Spanish and Belgian rescue team. But a broad smile spread across his face when he came face to face with his parents, Daphnee Plaisin and Reginald Claude. Dramatic photographs captured the moment when Félix del Amo, a Spanish mountain rescuer and diver, is seen pulling the terrorised child from a collapsed house. Óscar Vega Carrera, a Spanish firemen, also helped to get Redjeson out of the rubble. A much needed heart-warming story in an otherwise heart-wrenching situation. Donations are also coming in like gangbusters to every relief agency under the sun. $8 million alone just from text messaging. The good people of the United States and the world are responding to this situation in an unprecedented manner. Narcissism (nahr-suh-siz-em)- noun: Inordinate fascination with oneself; excessive self-love; vanity. Synonyms: self-centeredness, smugness, egocentrism. I didn’t want to write about this. I just wanted to ignore them. But, I couldn’t. 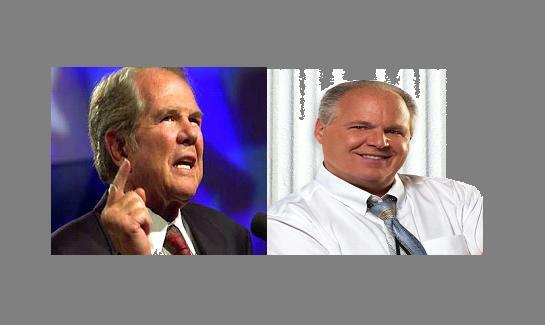 Pat Robertson and Rush Limbaugh are very good at getting publicity. This is how they help maintain their respective empires. I don’t mean to give them even more attention. But when Pat Robertson concludes the people of Haiti deserved what they got because they made a deal with the devil; when Rush Limbaugh criticizes President Obama for acting too quickly on Haiti-I have to add my two cents to much that has already been said about this. 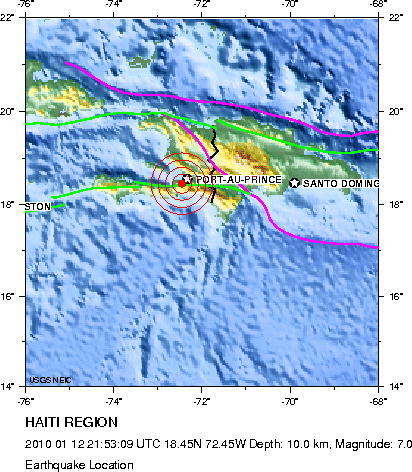 Something happened a long time ago in Haiti and people might not want to talk about. They were under the heel of the French, you know Napoleon the third and whatever. And they got together and swore a pact to the devil. They said ‘We will serve you if you will get us free from the prince.’ True story. And so the devil said, ‘Ok it’s a deal.’ And they kicked the French out. The Haitians revolted and got something themselves free. But ever since they have been cursed by one thing after another. Is he trying to impress us with his facile grasp of world history? Let me get this straight. The Haitian people made a deal with the devil to get the French to leave and are bad because they rebelled against the system of slavery? Exactly what is he trying to say? Is there a hidden message here about practitioners of voodoo? Does anyone really deserve to be crushed by collapsing buildings in a massive earthquake, let alone tens of thousands? Do children deserve to die in their school uniforms because their descendants kicked the French out? What kind of man, what kind of representative of faith and God, reaches such bizarre and cruel conclusions? This will play right into Obama’s hands. He’s humanitarian, compassionate. They’ll use this to burnish their, shall we say, “credibility” with the black community–in the both light-skinned and dark-skinned black community in this country. It’s made-to-order for them. That’s why he couldn’t wait to get out there, could not wait to get out there. The worst humanitarian disaster of the last half-century strikes the hemisphere and there’s something suspect about a quick reaction from the United States government- while people lay injured in rubble, and there’s a desperate race against time to save their lives? I ask again- what kind of man reaches such conclusions? In both these cases, I believe we have the kind of men who are in love with the sound of their own voices but oblivious to the content that actually passes their lips. It’s verbal narcissism. It’s the only way to explain it. It is times like these when the things that matter- and don’t matter- are put in stark relief. 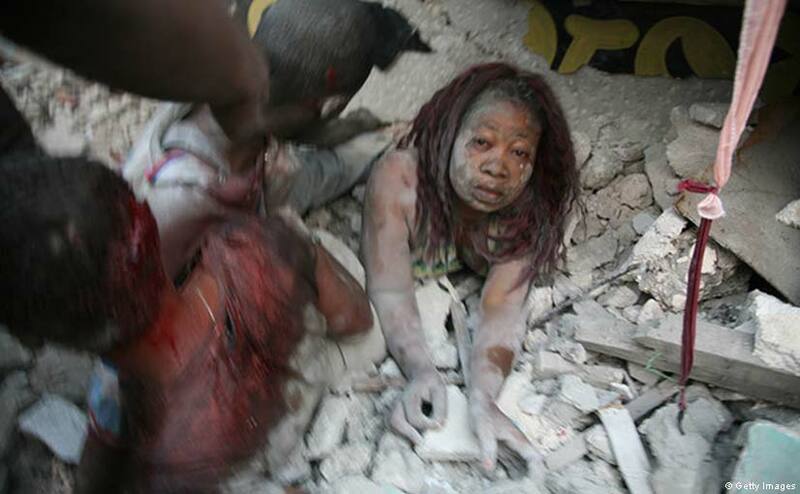 We will probably never know how many men, women and children perished in Tuesday’s horrific earthquake in Haiti. One hundred thousand, five hundred thousand. Whatever the number, it is beyond comprehension. The images are haunting and frightening. Hell unleashed upon the earth. The bodies of dead children lined up under blankets next to their shattered schools. The woman, pictured above, perhaps the iconic still-photo of this terrible disaster, dazed and covered with dust after she has just been rescued. The flattened Presidential Palace. The video on CBS News of the earth shaking as if highways and buildings had been placed in a dice tumbler. That is the horror of an earthquake-it is the land beneath your feet no longer being dependable. Nowhere to run. Life and silliness will resume soon enough. For now, the misery of a small, decimated nation with grief and terror heaped upon poverty and hopelessness, fills the screen and obscures all else. It is a scene of utter devastation. It was afternoon in Haiti when the earthquake hit and many kids were in school buildings that collapsed. Bodies are being piled up on the streets. From shacks that were home to the poorest of the poor to the Presidential Palace to the Headquarters of UN Peacekeepers, the capital city of Port-Au-Prince has been destroyed. It is a humanitarian disaster of the first order. These are reputable organizations that need donations to get relief to these people.